For Ride Leaders and Riders – in an effort to make the Ride Waivers more functional and user friendly for all, the Ride Waiver form that the Club requires all riders to review and sign before participating in Club lead rides has been revised and reformatted. A recent review of forms completed in the past found information crammed into boxes that were not wide enough and text scribbled in lines that were too narrow, so we’ve addressed that with this new release. 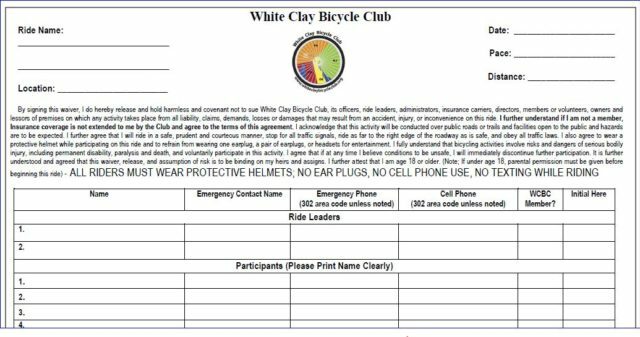 The new form maintains the same waiver language, however we have added “No cell phone use, No texting while riding” at the end of the waiver. Evidently this has cropped up on enough rides that some felt it was warranted. The form now has wider columns so the riders have the room needed to provide the information that is being asked of them, legibly. It is very important that you write legibly when you complete the form should that information be needed in an emergency. The signature line have been removed and replaced with a smaller column for initials, acknowledging that the rider has agreed to the conditions within the waiver. As of January 1, 2018 (or sooner if a Ride Leader prefers) the new Ride Waiver will be used for all Club lead rides. Should you have any questions or concerns, please direct them to me at President@whiteclaybicycleclub.org. Ride Leaders – the new form, in both Word DOC and Adobe PDF can he found under Ride \ Ride Leader Info on the WCBC website.